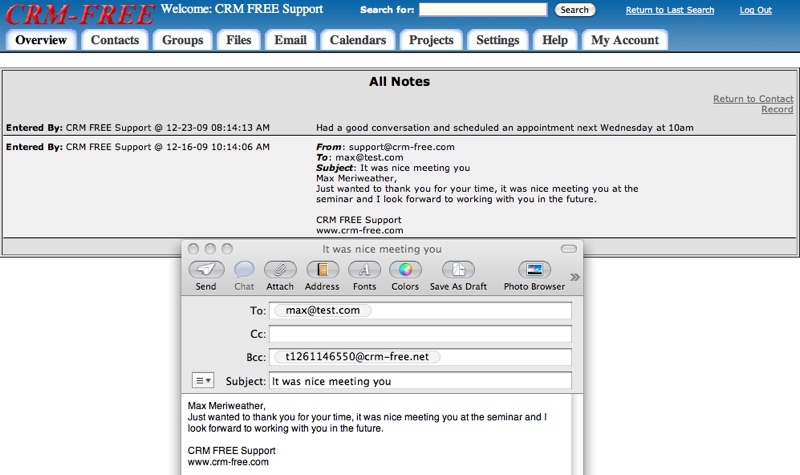 Now with a paid version you can send emails to CRM FREE to create new contacts, add a note to an existing contact or project, add a calendar item to a contact, project or just for yourself, forward an email you received from a contact into their record or bcc an email into a contact record when you email them. This saves time in copying and pasting data and simplifies keep all your data in one place. You can also add templates for emails you routinely send and when you select that template from a contacts page it will open your email program with the to address, subject and body entered as you selected. You can also merge certain data from the contact record such as their name into the emails... and the email will have your CRM-FREE email address as the bcc address to keep a record in that person's file. Below you see an email that was sent, each account has it's own email address to send into CRM FREE, and in the notes in the lower left is that email after it has been processed into the database. See more details on sending emails to CRM-FREE.